This is BBC’s Roy Plomley interviewing Jean Plaidy in June 1972. Special thanks to Pauline of the Jean Plaidy / Victoria Holt Facebook Group who found the link originally on the website Eleanor Hibbert Explained. I typed the below transcript by ear, so there may be some mistakes and discrepancies. Roy: Miss Plaidy, are you a Londoner? Roy: How old were you when you developed this fascination for the past, which has stood you in such good stead? Plaidy: I don’t know how old I was. I think it was always with me. I think I discovered it when I first went to Hampton Court when I was about seventeen. And I really felt the fascination of that place, and it just gripped me, and I think perhaps then I knew subconsciously that I had to write historical novels. Roy: You had that ambition as early as that? Plaidy: I had the ambition to write, but I didn’t know very much about it. When I started writing, I wrote nine novels, none of which were published, and now this is not quite so depressing as it sounds, because at the same time I was writing short stories, and I was rather successful with those. I sold them to the Daily Mail and Evening News and papers like that, so that I was selling something while I was writing those novels. Roy: What was the turning point? Plaidy: Well, the turning point was when I was selling my stories to the Daily Mail and the Evening News, and the fiction editor there was a very kind man, and he became an agent. And he said to me, “Now look here. Why don’t you write something which is sellable. You know you want to be a novelist. That’s your ultimate ambition.” Which was so. He said, “Why don’t you write some romantic novels? Lightish romantic novels.” So I took his advice and I did. And I wrote some of these. And then I wrote my first historical novel, which, was actually, it wasn’t a historical novel really. It was a period novel and it was set in Australia. And I hadn’t been to Australia at that time, but I was writing about Australia of the late 18th and early 19th century, and I thought, well my view of Sydney was probably as good as anyone who lives there and has the modernicity imposed on their view of it. And this book was a moderate success. Not a big success, but a moderate success. It was a promising start, shall we say. Roy: I know Jean Plaidy isn’t your real name. Was this the first time you used it? Roy: Now, Jean Plaidy made her first appearance with Beyond the Blue Mountains. How many books does she write a year? Plaidy: She publishes two. She may write more. Depends where she is. But we have publication dates at the beginning of the year in the Spring and in the Autumn. Roy: How many has she written? Plaidy: About 50. Maybe a little more. But around about 50. Plaidy: Well, speaking chronologically, the first one is about Edward IV and Richard III, and that’s about 1480 or something like that. And the last one I wrote ends in 1901 with the death of Victoria. It’s not published yet, but it ends there. So I’ve covered quite a wide field. Roy: About 450 years. Which is Miss Plaidy’s favorite period? Plaidy: Well, it’s always the one you’re writing about at the time. It’s very difficult to say which is the favorite. I think the Tudor period is a wonderful period for a writer. And also the Stuart period. They are not periods in which I’d like to live in, but they’re wonderful for the historical novelist. Roy: She’s also written a few non-fiction books? Plaidy: Yes, I’ve written three books on the Spanish Inquisition, the Rise, the Growth and the End. And also a book of short biographies of poisoners. Roy: All Jean Plaidy’s books, although fiction, have been carefully researched. The backgrounds are authentic. Plaidy: Oh yes, yes, yes. They are authentic history in the form of a novel, really. Roy: Yes. 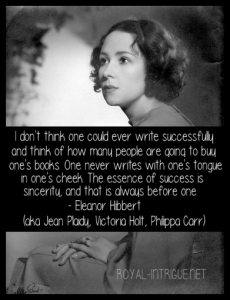 I’ve been referring to Jean Plaidy in the third person because she’s only half of a literary split personality. You are also Victoria Holt. Roy: Miss Holt also writes historical novels of a rather different style. Plaidy: Well, I don’t call them historical novels. They are what we call the Gothic novel. And they have fictitious characters set against a period background. It’s an authentic background, but it’s period, as compared with historical. You know what I mean? Roy: In other words, vague, could we say? Plaidy: Vague background, yes. Everything, the things they used are the things that would be used at that time, but history does not really play a big part in it. Roy: Miss Holt is not so prolific as Miss Plaidy. Plaidy: Miss Holt publishes one book a year. Miss Plaidy publishes two. Roy: Which lady sells better? Plaidy: It depends in what part of the world you’re in. Jean Plaidy sells very well here, particularly in the paperbacks. Pan publishes the paperbacks and they sell quantities of them of the various titles. In America, Victoria Holt is a bestseller. And not the last one because the figures haven’t come out for that yet, but the one before that was one of the ten bestsellers of the year in the United States. Roy: Will you describe the difference in the types of the novels? Do the two ladies aim at different sorts of readers? Plaidy: They don’t really aim at anything because I never work mechanically. I never think I’m aiming at this, that, or that sort of thing. I just sit down and write a piece of life. Something that is in me and I want to get out. But they are different publics, of course. Jean Plaidy’s public are people who like history or want to learn something about it, or know something about it and want to polish up what they already know. Victoria Holt readers are largely women. Jean Plaidy’s are both sexes, all ages. Victoria Holt’s are all ages, but women mainly. And they want a good story. They want to lose themselves in a story. They want characters whom they can love or hate but there must always be one with whom they can identify themselves and feel sympathy for. Roy: In other words, Miss Holt is more advisedly commercial in approach? Plaidy: Well, I don’t know. I never think of the commercial side of it at all. I don’t think one could ever write successfully and think of how many people are going to buy one’s books. One never writes with one’s tongue in one’s cheek. The essence of success is sincerity, and that is always before one. Roy: Miss Plaidy, how do you plan your writing day? Plaidy: I’m very regular in my habits. I get up rather early, particularly when I’m in the country, and I’m in the country for the summer usually. I write for about five hours everyday. Not five hours right off because there are all sorts of little things one has to get up and do. Domestic things, and so on. And my five hours is spread over the day. And all my proofreading and research does not encroach on those five hours. It’s five hours sheer writing, but it’s regularly at my desk every morning. I don’t get tired writing, actual writing. I find it very stimulating, but working hard at the typewriter can be rather a physical strain. Roy: You work straight onto the typewriter? Plaidy: I work straight onto the typewriter, but I’m the world’s worse typist, and I have a typist who does it all properly afterwards. Roy: How much revising do you do? Plaidy: Quite a bit really, although, I think it all comes out when I’m very, very excited. I think that’s how you should write a novel. You sit down. You just pour it out. You don’t stop to wonder whether you’ve got your sentences around the right way. You just get on and get it. The story is the main the thing; the characters and so on. Roy: How many days a week do you work? Plaidy: Well, I would work any day, but of course there are social engagements and things which crop up and which can encroach on days quite a bit. But I do work everyday, if I’m at home. Roy: Seven days a week? Plaidy: Seven days a week, yes. Roy: So, you can be described as a compulsive writer? Plaidy: I’m absolutely a compulsive writer. Roy: You write sometimes in London, sometimes in the country. You like to go to a warmer climate for the winter? Plaidy: Yes, I do and I find this is very profitable because I go around the world, usually, I’ve been around the world about seven or eight times I think. And I leave in January and come home in April, which is a lovely time to come home to this country. But when I go around the world, I meet publishers and the public and do signing sessions. And I’ve just been launching my latest Victoria Holt, In the Shadow of the Lynx, which I set about 40 miles north of Melbourne, so I did quite a lot in Melbourne for this book. Roy: When you go off on a cruise around the world, how many books do you come back with? Plaidy: Well, usually only one, because I write in my cabin in the mornings only, and of course there is so much to do at the various ports. I really am working very, very hard on publicity in various ports, and I need a little bit of relaxation on board. So, if I come back with one book, I’d say that’s pretty good. Roy: Now because of your large output and because your books are classified under the heading romantic fiction, you’re ignored largely by the critics. Does that worry you? Plaidy: No, it doesn’t worry me in the least, because I have my dear, faithful public who are waiting on my books, and some of them write to me and say, “Why don’t you write more? It doesn’t take us six months to read a book. Why don’t you produce more?” So I’m not the least bit worried about the critics. I don’t think they’re important to me at all. Roy: You laugh all the way to the cruise ship. Roy: Miss Plaidy, what are your interests other than literary? Plaidy: I don’t really have any. I don’t have time really. I have to do such a lot of research. I spend my time at libraries, going through letters and so on. I have very little time for anything else. I do like a game of chess if I can get hold of a partner. Roy: But no pursuits that might be useful to a castaway? Plaidy: Well, I’m afraid not. Roy: On all your travels abroad, have you visited any places that would give you some ideas for putting up a shelter, and could you put up a shelter? Plaidy: Well I don’t think I’d be very good at putting up a shelter. I can’t see myself chopping down a palm tree. I think I’d make some sort of refuge with the branches and leaves, something to crawl in. Because I have been to islands which would be desert islands if you pushed the people off them. One I particularly like is Lindeman Island in the barrier reef, which is an absolute paradise of a place, if I had to go there, I would like to go to that one. Roy: What about food? Every done any fishing? Plaidy: No, I wouldn’t do any fishing, because I wouldn’t like to kill them. I should hate to catch a fish and have it looking at me with those awful eyes. But if there’s plenty of food I should be alright, because I practically live on oranges now, so if you provide oranges and coconuts I’d be perfectly happy.